Gather 4 to 6 friends and family and have a fun day casting! Here on the following pages is an overview of the cement and leaf castings made in my studio in downtown Kingston. My work is available at shows listed below or here at the studio. Call first, please. You are welcome to visit but as I may be casting, we'll have to arrange a time in advance. I offer cement designs in bird baths, fountains, garden tables and much more. Please visit me at the shows listed below to see my newest work. 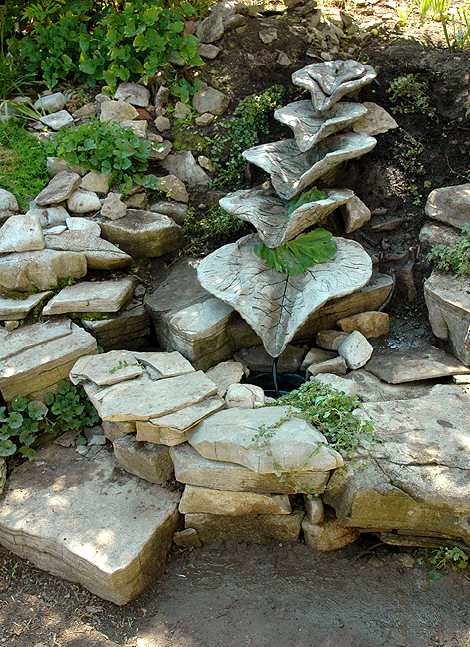 Below is a 5 foot fountain installation I designed for Providence Spirituality Centre Kingston. 21980 Hwy. 7, Maberley Ont.